The Richard Donovan Correctional Facility and Tender Loving Canine Assistance Dogs are teaming up to transform lives. As NBC 7's Todd Strain shows us, the effects are being felt inside and outside of the prison walls. When Christy Nielsen was searching for a new dog, she didn’t go to a pet store, or a breeder or even a shelter. Instead, Nielsen found her Pomeranian, Tinker, at the Omaha Correctional Center. Tinker is one of hundreds of dogs that has been fostered by inmates at the prison as a part of their Canine Compassion program. “I see the closeness the inmates have with the animals. They really take good care of them,” said Nielsen, an associate director of nursing at the prison. Across the country, prisons and animal shelters are forming partnerships that put inmates in charge of training unruly dogs, giving both parties a chance at a fresh start. Inmates at the Airway Heights Correction Center in Spokane, Washington, during an obedience class for prisoners and their dogs. Carol Byrnes is a professional animal trainer based in Spokane, Washington. Once a week she volunteers with local shelter Spokanimal, leading obedience classes for inmates and their dogs at Airway Heights Corrections Center. “A lot of the dogs come from high kill shelters. Sometimes it’s life or death for these dogs that get to come here,” she said. Byrnes was initially hesitant to get involved, but she developed a passion for the program after seeing the transformative effect it had on participants, both human and canine. 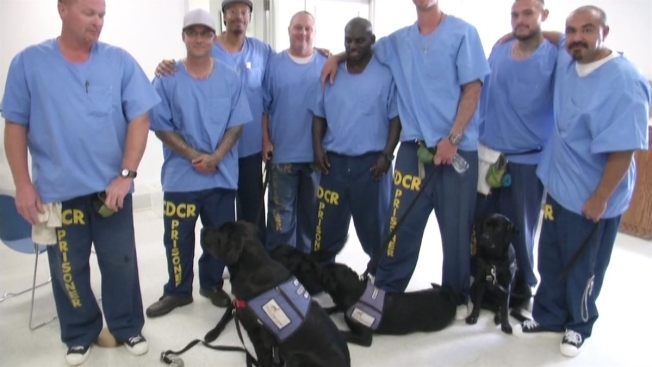 For inmates and dogs who start off as distant or hard to reach, “as the program progresses, they open up, they blossom, they gain confidence, they gain social skills and the ability to problem solve and negotiate difficulties,” she said. 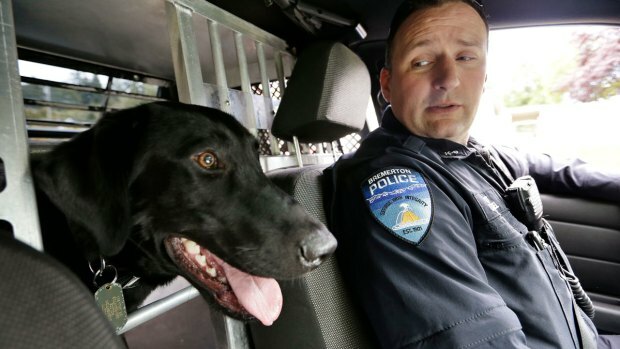 Prison animal programs have been gaining traction in recent years, though the first documented account of a dog used for inmate rehabilitation can be traced back to 1925. ISIS was raised in prison, but she wasn't doing hard time. The bombing-sniffing pooch was trained by female inmates at Florida prison to become a service dog as part of a program called Puppies Behind Bars. NBC 6’s Julia Bagg reports. The details of each program differ but most follow the same basic guidelines. Dogs with behavioral issues who are not yet ready to be adopted are sent to live in a cell with their caretakers. 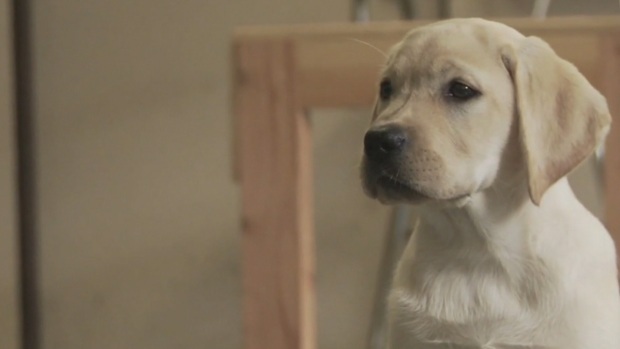 For up to 16 weeks, the inmates are responsible for walking, feeding and playing with their dogs. Inmates also take part in formal obedience classes, teaching their animals the basic commands like sit and heel. In order to take part in the program, inmates have to exhibit good behavior for at least one year prior. "I enjoy the challenge of training them. I like having the hard cases,” said Chris Williams, an inmate dog handler at Southern New Mexico State Correctional Facility in Las Cruces. 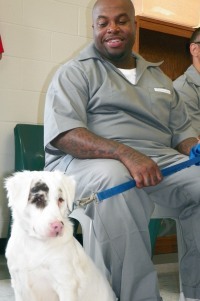 In this April 16, 2015 photo, Sean Like, who is serving a 25-year sentence for second-degree murder, sits with Petey during a ceremony at the Missouri prison in Bonne Terre marking the 3,000th dog adoption through the Missouri Department of Corrections' Puppies for Parole program. For Williams, the Prisoners and Animals Working Toward Success program, or PAWS, has provided an incentive to stay on the right path. “I spent most of my time locked up in maximum security before coming to this state. I used to be a big trouble maker and then I got here and got involved in the program and I’ve been doing pretty good,” he said. Renee Waskiewicz, a hearing officer who oversees PAWS at the prison, said it has helped the inmates correct some of the behaviors that may have landed them in jail in the first place. Kimberly Collica-Cox, associate professor of criminal justice at Pace University in New York, has studied how the symbiotic relationship between humans and dogs can be useful in prisons. Collica-Cox helped develop a program through Pace that uses animal assisted therapy to teach incarcerated mothers better parenting skills. “What we find is that dogs can trigger feelings of safety in humans, which will allow them to sort of open up and communicate more, which can be very helpful in a correctional setting,” she said, adding that there’s a great deal of research to support these findings. One study published in the Journal of Behavioral Medicine showed that human-animal interactions can actually lead to lower blood pressure and heart rate, two physiological indicators of stress. Psychologists studying a prison-based animal program in the UK concluded that working with animals helped inmates develop a deeper sense of responsibility and trust. This resulted in enhanced communications between peers as well as with staff. Perri Peltz, director of “Prison Dogs”, stops by to discuss the film that documents New York inmates who train service dogs and the veterans who receive them. Although working with the dogs can be difficult at times, for Justin Chinn, an inmate at the Omaha Correctional Center, saying goodbye is always the hardest part. Even though it’s been nearly two years since they parted ways, Chinn said he still misses the first dog he ever trained, a black lab named Maisy.